“Scientists trekking deep in Colombia‘s La Mesenia Reserve Forest recently spotted a young olinguito, a mammal that was just confirmed as a new species in August. Scientists say it is the first new carnivore found in the Western Hemisphere in more than three decades.” Photo and quote via National Geographic. A newly discovered species is always exciting, but when the critters are this adorable, enthusiasm skyrockets! Unfortunately, the olinguito’s position in nature is far from secure. 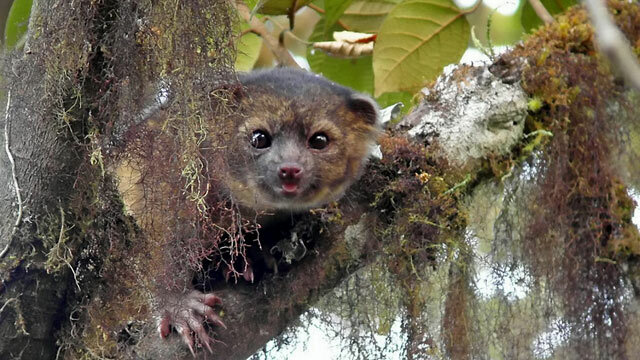 According to SavingSpecies, “the olinguito lives in the precariously delicate cloud forests of the western Andes”, an area that is “threatened by nearby development, logging, and even mining and other harmful extraction activities.” Cuteness doesn’t outweigh profits in the eyes of exploitative businesses. More saliently, preserving the region’s precious biodiversity is callously disregarded in favor of stripping the area’s lucrative natural resources. Photos via The Guardian and Wikimedia. Roger Harris, the secretary of SavingSpecies’ Management Board, also heads up Biodiversity Professionals, a LinkedIn group that has garnered more than 15,500 members (as of May, 2014), making it the largest of its kind. Harris expanded the group further by creating a dedicated website, thus adding another venue for discourse among ecology experts. This leadership position means that Roger Harris is uniquely situated to describe the field’s concerns. He can hardly avoid it, since he oversees a conversation with thousands of informed participants. According to him, key issues include the impact of climate change on biodiversity, greenwashing by corporations and big conservation organizations, funding small-scale conservation efforts (“more effective per dollar than big budget projects”), and public awareness about the importance of biodiversity. Harris is worried about that last topic, which he describes as being in an “unprecedented decline”. So what can you do to help out? Well, the olinguito would surely appreciate your spare change. If you can’t afford donate–many of us have more time than money–consider promoting clean ecosystems on the home front. Educating yourself and your family is a great first step, and cleaning up your neighborhood is the natural progression!